Scream2SFS is a Windows add-on to Scream! for receiving real-time Guralp Compressed Format (GCF) data over a network and saving them in Seislog SFS format. Once set up, the program is designed to start automatically, remembering previous configurations. Scream2SFS is designed for use with real-time data. If you want to import existing GCF files into SEISAN, you should use GCF2GSE instead. To install, unzip the file scream2SFS.exe, and place it in a suitable directory (e.g. C:\Program Files\Guralp Systems). You may also need to install the Qt library, qtintf.dll. By default, Scream2SFS will listen to network traffic being broadcast to port 1568. You can change this port number by altering the value in the Rx Port box. To set up a Scream! server to push data, open the My Server tab of Scream! 's Network Control window, right-click in the Clients list, and select Add…. Enter the numeric IP address and port of the computer running Scream2SFS, separated by a colon. In this example, Scream! 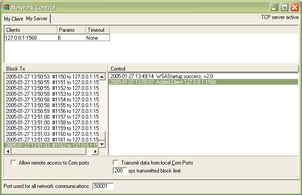 is transmitting to a copy of Scream2SFS running on the same computer (127.0.0.1:1568). Any streams it receives will be passed on to Scream2SFS. You can also run Scream! servers on Guralp DCM units. See the unit's documentation for more details. Select the streams you want to convert, and add them to the right-hand panel by clicking Add ->, or by double-clicking on them. The order that the streams are added will determine their order in the SFS file.Once added, a stream will no longer be listed in the Streams box. In the Output Dir box, enter the directory where you want SFS files to be saved. If the directory does not exist, it will be created when you start recording. 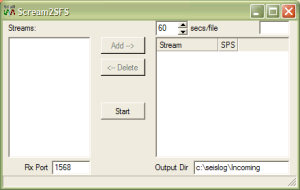 The SFS file format includes space for a user-specified string, intended to identify your seismic network. To set this string, enter a value in the box at the top right of the window. By default, Scream2SFS will start a new SFS file every 60 seconds. To change this, alter the value in the secs/file box. When you are ready to start recording, click Start. SFS data will be saved until you close the program. Scream2SFS will save its settings in a Scream2SFS.ini file in the program directory, and reuse these when you next run it. To start Scream2SFS automatically on reboot, add a shortcut to the program file to the Startup folder on Windows' Start menu. See the Windows documentation for more details. Whilst recording, Scream2SFS displays information about the GCF blocks being received in the status bar at the bottom of the window. To log information about the data coming into Scream2SFS, use the command line parameter /LogI. To log information about the data being recorded by Scream2SFS, use the command line parameter /LogO.